In my post, I explained how we can create a simple wizard using jQuery. 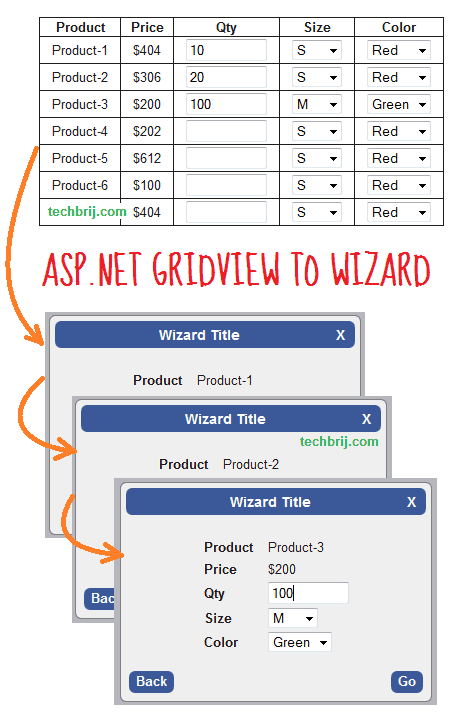 In this post, we’ll see how asp.net gridview can be displayed in wizard format. Sometimes, gridview is used to take input from user when multiple fields are required many times. It is not user friendly, We can use wizard but not easy to handle on server side as in gridview. So, It’s better to convert ASP.NET gridview to jQuery wizard. So, no need to change on server side and UI is also more user convenient. We’ll convert gridview structure to wizard structure as explained in this post and use wizard.js. If you have to convert HTML Table instead of asp.net gridview, replace <%=GridView1.ClientID %> with your table ID in above code. Same setting is used in which btnNextClicked, validateStep and validateByTitle are functions. See this post for more details about functions. Hope, It helps. Enjoy playing with jQuery !!! Hi, can we have code for this post.